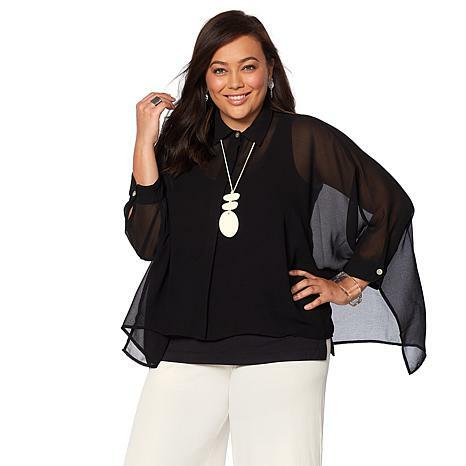 For a voluminous silhouette that complements every body type, this chiffon poncho blouse is ideal . Wear this unique garment closed over a WynneLayers tank and narrow-leg pant, or leave it open (the hidden placket creates a finished look). Loving the way my skin feels when wearing this fantastic top.. it flows with a wonderful unique comfort. This is my second shirt purchased. Since I was attempting to steam the wrinkles out, my iron accidentally touched the shirt and burned/melted the back of the shirt. I was devasted. Nonetheless, I immediately called and was happy to learn HSN had "1" shirt left in my size!!! Of course I purchased and now my outfit (with tank) is complete. Love the look, the flowy-ness of the fabric. I look good in the ensemble. LOL!!! Beautiful,comfortable & elegant. Fabric is beautiful and makes me feel so pretty!Thank you Marla! Very cool looking ..... !!! love it. Got all 4 colors.